Never Enough Nails: China Glaze Haunting Collection Preview! Los Angeles, CA – (July 2011): Halloween is all about over-the-top style and China Glaze has just what every girl and ghoul needs to complete their costume. 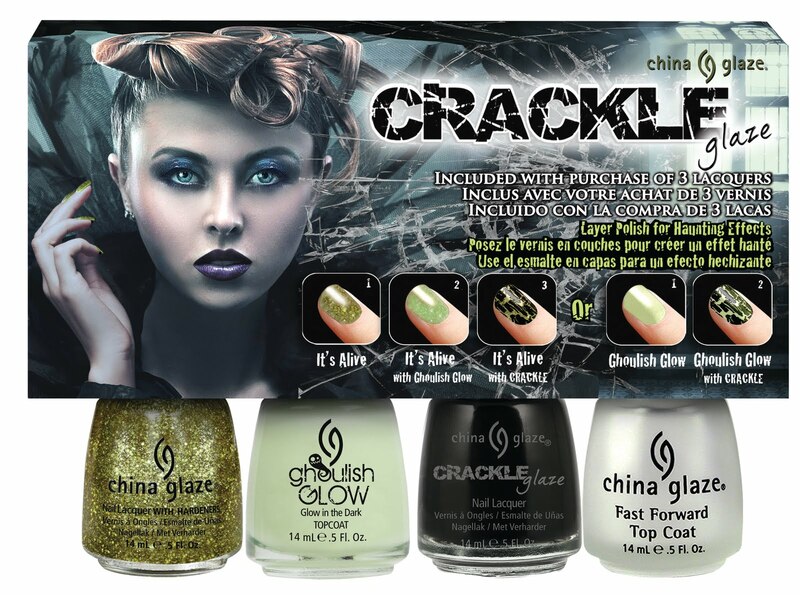 Put the finishing touches on any look with the new China Glaze HAUNTING collection – a six-piece set of mysterious colors and effects perfect for All Hallows Eve, including a glow-in-the-dark Top Coat and a ‘crackling’ top coat for a cobweb effect. The China Glaze HAUNTING collection will be available as open stock colors, 18 piece counter display, and as part of a special “Buy 3, Get 1 Free” set featuring China Glaze Fast Forward Top Coat. China Glaze nail lacquers are available through salons and professional beauty supply stores nationwide. For more information, visit: www.chinaglaze.com or follow China Glaze on Twitter: http://twitter.com/ChinaGlaze "
I need to get It's Alive and Haunting for sure!!! What do you have your eye on?